The Pacific bluefin tuna could become extinct if a two-year ban on commercial fishing is not enacted, according to an environmental group. A a recent meeting in Japan, the Pew Charitable Trusts Global Tuna Conservation Program, it was revealed that the current bluefin tuna population is at just 2.6 of it historic size. The stock assessment concluded the world’s largest tuna fishery – located in the western and central Pacific – has been fished down more than 97 percent. “Scientific estimates have indicated that the population of Pacific bluefin tuna is severely depleted. Still, the governments charged with managing the species continue to deny them a viable rescue plan despite clear indications that the population is hovering near an all-time low. Commercial fishing continues at a rate up to three times higher than what is considered sustainable. 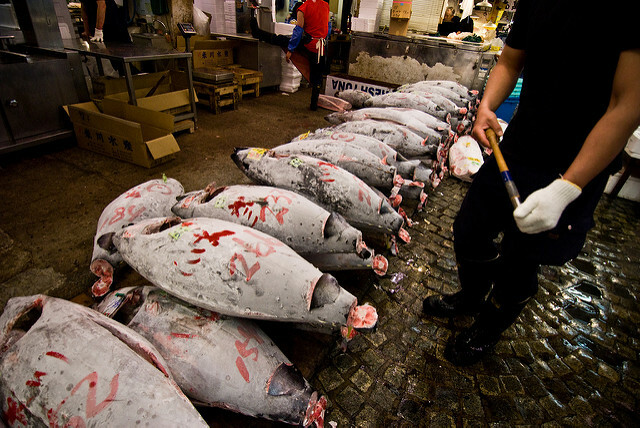 This must come to an immediate end,” Director of Global tuna conservation for Pew Charitable Trusts, Amanda Nickson said. Although the tuna we typically find in pre-packaged cans is the skipjack tuna, worldwide consumption of sushi and sashimi has increased the demand for its meatier counterpart. The bluefin tuna, the most highly valued of its kind, has surged in popularity over the last few decades – generating at least $2 billion to $2.5 billion a year in the global marketplace. 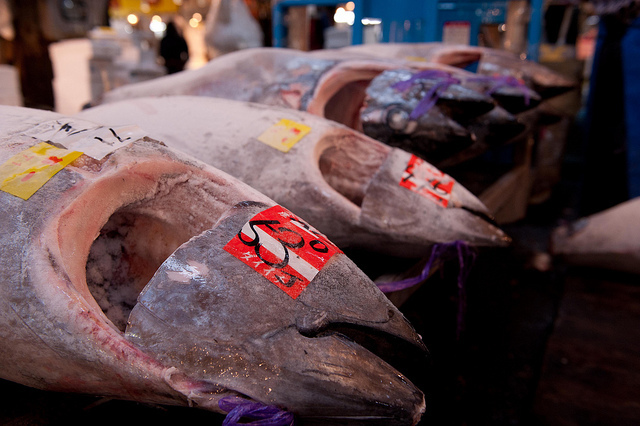 Populations of both Pacific and Atlantic bluefin have been in decline since the 1960s. In 2014, Pacific bluefin’s status was changed from “least concern” to “vulnerable” by the International Union for Conservation of Nature. Despite the alarming figures released in the new stock assessment, its status will not be reconsidered this year. In addition, the report also highlighted that the two major commercial fishing bodies, the Inter-American Tropical Tuna Commission, which met last month in California, and the Western and Central Pacific Fisheries Commission, which meets in December in Fiji, have consecutively failed to agree on a Pacific-wide recovery plan to increase and sustain the bluefin tuna population. Ninety percent of all bluefin are caught in the Western Pacific. While American boats pull in around 1 percent of the international bluefin haul, 80 percent of Pacific bluefin caught each year are consumed in Japan. However, as the bluefin is a migratory species, international agreements must be met if any conservation effort hopes to be successful – which would likely prove to be no easy task. Bluefins migrate some 6,000 nautical miles across the Pacific, from Japan to California, and back again. As a result, even if conservation efforts successfully sustained a percentage of the population, there is nothing to stop the fish from swimming across the ocean and being caught off Japanese shores. “We can save as many as we want in the Eastern Pacific, but if they go to the Sea of Japan and get caught, our conservation efforts are for naught,” said Barry Thom, deputy regional administrator for the West Coast Region of NOAA Fisheries.. In light of this fact, Pew Charitable Trusts Global Tuna Conservation Program are calling for a two-year ban on commercial fishing. Meanwhile, as Marine ecologist Carl Safina points out in his article for the Huffington Post, consumers are also partially responsible for the overfishing of this incredible species – and are therefore also part of the solution.